As in the Player’s Handbook, Xanathar’s Guide to Everything starts with Barbarians and continues through the classes in the same manner. Barbarians remain one of the easiest classes for D&D newcomers to play, but XGTE manages to give them some extra flair and specialization that can diversify play styles and add to both combat and role play. 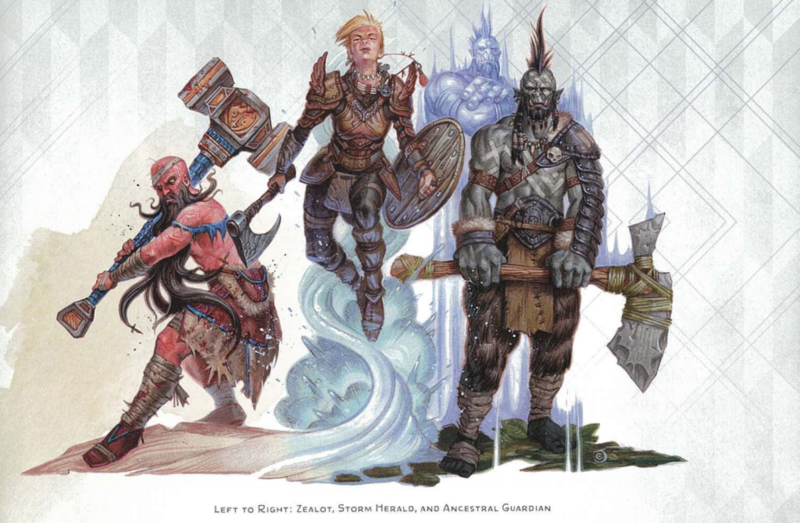 Xanathar’s Guide offers three subclasses: Path of the Ancestral Guardian, Path of the Storm Herald, and Path of the Zealot. Path of the Ancestral Guardian provides a shamanistic twist to the barbarian. This is perhaps one of the best routes for a support barbarian to take. Out of the four class features offered for this Primal Path, three of them are geared towards ally support in battle. This subclass allows for reactions to reduce damage to allies, and eventually retaliation damage equal to the amount of damage reduced. At 10th level, the ability to consult with ancestral spirits through the spells augury or clairvoyance is added, though it is more valuable as a roleplay tool than anything. Spellcasting has never been a specialty for barbarians, and here it is flavor rather than substance. The next Primal Path is the Path of the Storm Herald, truly meant for the people who like the nature aspects of druids, but also want to be melee damage dealers. This subclass has a higher damage output than an Ancestral Guardian barbarian and adds elemental damage types to the barbarian repertoire. When this subclass is taken at 3rd level, it is required to choose an “environment type” that can be changed every time a level is gained in this class. The choices are desert, sea, and tundra, which have their own benefits. Through these environment choices, a Storm Herald barbarian can gain resistances and add magical effects to their rages. This subclass is very thematic, perfect for the Viking-themed barbarian or the hardened survivor of the elements. Those themes could easily be either an asset or a detriment in adventures that involve many elemental creatures. A player in such a campaign would need to put some forethought into their potential upcoming battles, especially at higher levels when it will take longer between environment changes. 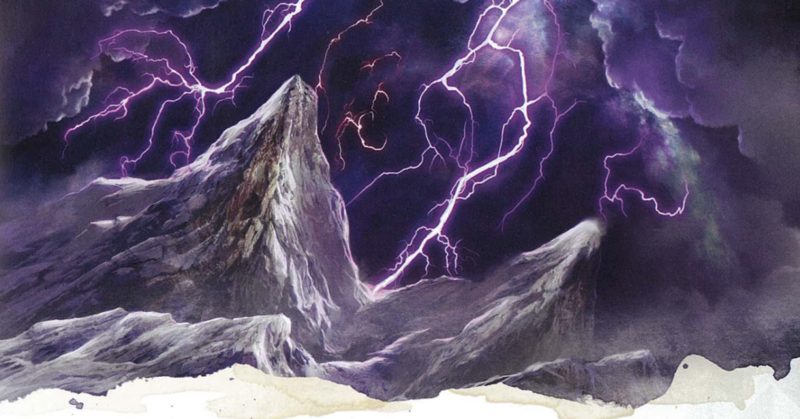 Despite this potential issues, the Storm Herald adds a nice flavor to create a fearsome and magical barbarian. The final subclass offered is the Path of the Zealot — perfect for the player interested in playing a cleric who doesn’t want to bother with spells. When this subclass is chosen, there’s the option of dealing additional radiant or necrotic damage, though you must pick immediately. Extra damage types are almost always helpful, however in an adventure laden with undead — such as Curse of Strahd or the more recent Tomb of Annihilation — a barbarian dealing 1d6 plus half of their barbarian level per turn could be a slight disservice to their party. Two of the biggest draws of this subclass remain the ones pointed out when XGTE came out: the features Fanatical Focus and Rage Beyond Death. Fanatical Focus, gained at 6th level, allows the Zealot to reroll a failed save while raging, though it can only be used once per rage. Even though damage is halved, a fireball spell at 6th level hurts, and getting a chance to try that Dexterity save again is always a bonus. 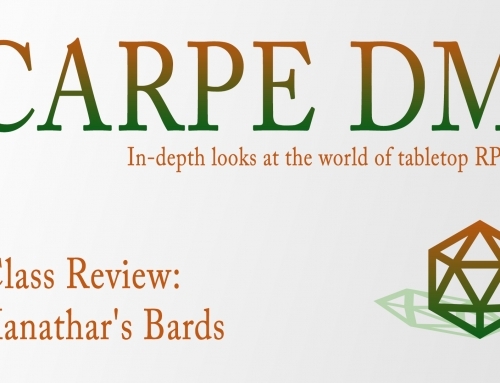 Rage Beyond Death is attained at 14th level, at which point a barbarian on this path no longer falls unconscious upon dropping to 0 hit points. Though death saving throws still have to be made and damage rules past 0 still apply, this barbarian may continue to rage. Even if they were to fail all of their saves, the Zealot would not die until their rage ends — and at that point, only if they still have 0 hit points. Xanthar’s Guide did a great job of adding more substance to the barbarian beyond brute force. 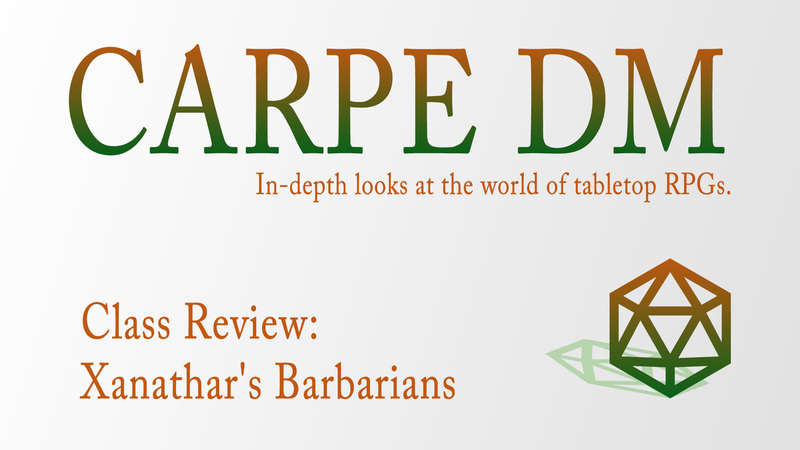 Many a D&D player has found the barbarian easy to play mechanically, but harder to role play, often cornered into the “smash stereotype.” These Primal Paths add exponentially to the role play potential of barbarians, and while they have other merits, this is what really sets them apart from the Player’s Handbook barbarians at the end of the long rest. Author’s favorite: Path of the Storm Herald. Dungeon Master, caffeine enthusiast, Chaotic Good. I probably liked it before it was cool.